FACT CHECK: Did These GOP Senators Vote Against Reauthorizing the 'Violence Against Women Act'? Did These GOP Senators Vote Against Reauthorizing the ‘Violence Against Women Act’? Six Republican members of the Senate Judiciary Committee, but not the "ranking member," voted against this particular measure. The six Republican "ranking members" of the Senate Judiciary Committee voted against the reauthorization of the Violence Against Women Act in 2013. 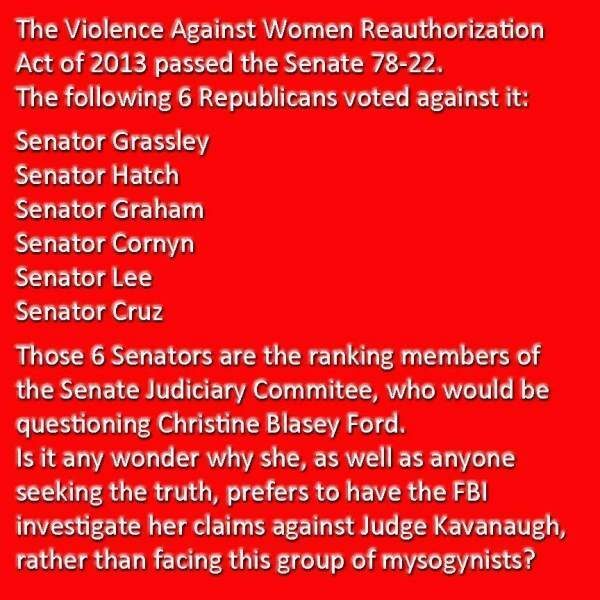 The six listed senators are Republican members of the Senate Judiciary Committee, and they all voted against the Violence Against Women Reauthorization Act of 2013. The only "ranking member" of the Senate Judiciary Committee is Democratic Sen. Dianne Feinstein, who did not vote against the act. As debate surrounded the prospective Senate testimony of Christine Blasey Ford, who accused Supreme Court nominee Brett Kavanaugh of having sexually assaulted her more than 30 years earlier, an image was circulated online accusing Republican members of the Senate Judiciary Committee of being unable to hear her allegations impartially, given their prior vote on a related issue. The image stated correctly, that the six named lawmakers had voted against the Violence Against Women Reauthorization Act of 2013. 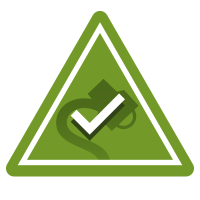 That measure ultimately passed the Senate by a 78-22 vote on 12 February 2013, was approved by the House six days later, and was signed into law by President Barack Obama on 7 March 2013. Technically, this characterization is not accurate, as a “ranking member” is the most senior member of a legislative committee who belongs to the minority party. A committee can have only one ranking member, and in this case that member is necessarily a Democrat (since Republicans currently hold the majority in the Senate), Sen. Dianne Feinstein of California. Each committee determines the order in which Senators question witnesses. A common practice is to alternate between Senators from the respective parties in order of seniority. Some committees operate under a so-called early bird rule or practice, which instead permits Senators to question witnesses based on the Senators’ order of arrival at the hearing. Some committees use a combination of these two methods, and committee chairs often allow Senators to proceed out of order. Also, Senators often submit written questions to which witnesses can respond in writing following the hearing. The New York Times. 14 March 2012. Congressional Research Service. 6 December 2017.